Barry Williams was launching his own business, focussing on prepaid funeral plans, will writing and estates planning. 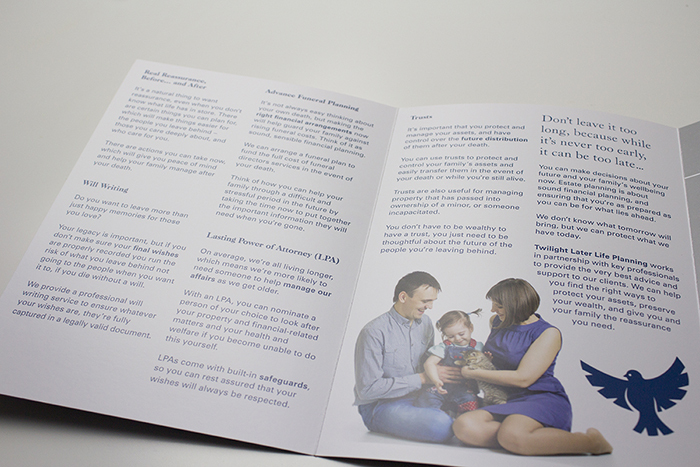 He wanted a distinctive look for his website and supporting material in the form of a printed brochure. 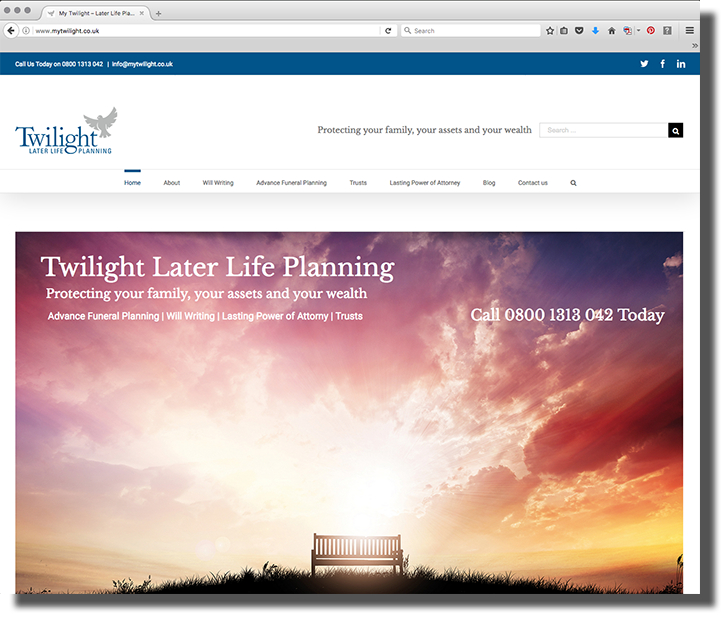 Twilight Later Life Planning offers a comprehensive funeral planning and will- writing service, as well as key aspects of personal financial planning, including Lasting Power of Attorney and setting up trusts. Barry’s needed to make his business approachable and warm, without resorting to any of the well-worn clichés relating to funeral planning, wills and estates. This is an area requiring care, sensitivity and cool professional judgement. On the one hand, resorting to imagery that was either overly sentimental or morbid could deter visitors and potential customers. On the other hand, being too brash risked offending people who found the issues around death difficult to deal with. Also, Barry was clear that his business was as much about planning for continuity, and for the future, as it was for death and funerals. In short, it was about getting the tone right as well as the content. We listened carefully to how Barry described his business, and how he wanted to be able to connect with his clients. We understood that his brief required us to look beneath the surface and find a way of talking to Barry’s audience that reached beyond funerals and wills. 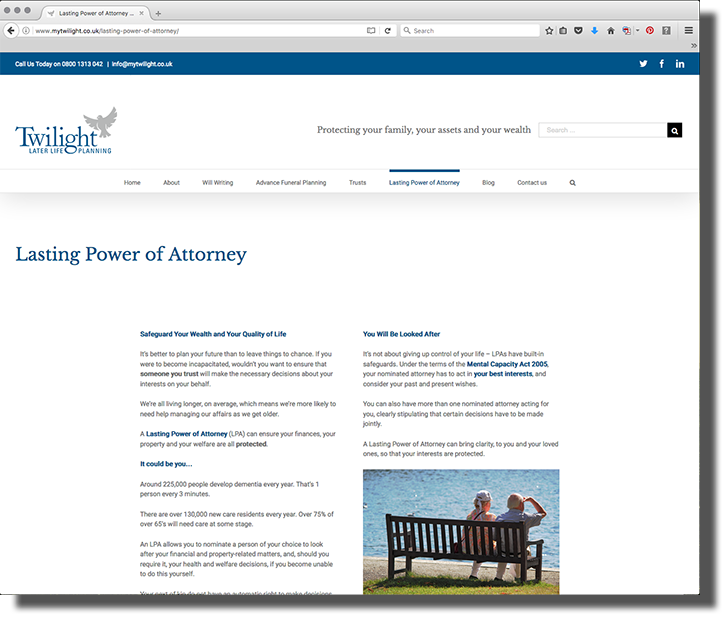 We used the site and the brochure to prompt the target audience – people in their 50s and older – to think about the future and the benefits of making plans now, while they have the time to do so. The tone was informal but authoritative, positioning Barry as someone they could trust with their future financial planning. A key element was the brand imagery. Again, this had the potential to be tricky, because of all the associated images with death, funerals and aging. The solution was to look at absence, but frame it in such a way as to appear warm, almost comforting. it also suggested a kind of reassurance and optimism. 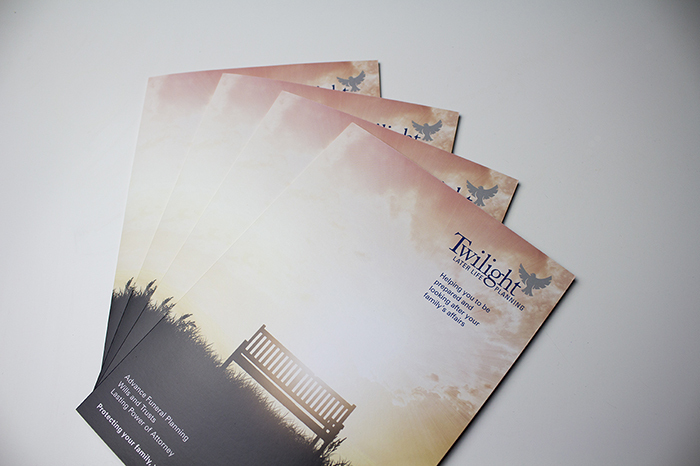 The material we designed for Twilight Later Life Planning captures a certain sensitivity while being also reassuringly informative, welcoming and persuasive.